On the occasion of the publication of the book Señores del Caos (Es Pop Ediciones), Miguel Porto, cover artist and illustrator of the Spanish edition of this classic of the musical and cultural journalism by Michael Moynihan and Didrik Søderlind, has created a folder composed of three screenprints in which captures his fascination with the iconography of Norwegian black metal. It is a series of 99 numbered and signed copies, edited by Vidas de Papel in collaboration with Es Pop Ediciones. 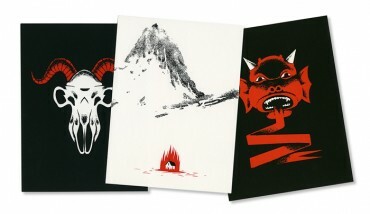 The folder includes three new variations made by Miguel Porto from illustrations originally created for the book edition, screen printed with two colours on 15x20 cm Conqueror Connoisseur 300 gms paper. The external folder is laser etched on black-mate painted 380 gms cardboard. The folder can be purchased individually or as part of a pack together with the book by Moynihan and Søderlind.